Tiger Woods will return to his PGA Tour roots when he resumes his comeback early in 2017. The 14-time major winner has committed to play in the Genesis Open, formerly the Northern Trust Open, at Riviera Country Club in Pacific Palisades, California, on 16-19 February. “I’m very excited to come back to Riviera and compete in the Genesis Open,” said Woods, who last played in the event in 2006. The 40-year-old’s foundation now hosts the event and, speaking in a video recording, he added: “I’ve always loved playing at Riviera. In his first competitive outing for 15 months, Woods finished 15th in an 18-strong field for the Hero World Challenge in the Bahamas earlier this month. Clarke Lutton has swapped the Middle East for Marbella as he hopes a change can help him scale the heights on the Alps Tour. 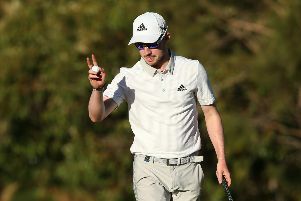 The Aberdonian has already negotiated the first stage in the third-tier circuit’s Qualifying School and is now preparing to tackle the final, which gets underway tomorrow at La Cala in southern Spain. “It was a very steady couple of days for me in stage one,” said Lutton of firing rounds of 69 and 73 to progress comfortably in joint-fourth. Lutton, who was 13 when his family moved to Qatar, has turned to the Alps Tour after deciding to set up base closer to home. “I’ve moved down to Marbella,” revealed the 27-year-old, who made the cut in the Qatar Masters on the European Tour back in January. “The main reason was my wife and I wanted to be closer to Scotland and Spain was a good choice. I had been in the Middle East for 15 years, so it was time for a change. Henrik Stenson has been named as the European Tour Golfer of the Year for the second time in four years. It followed a sensational season for the Swede, who won The Open and finished second in the Olympics as he was crowned European No 1. “It has certainly been the best season of my career and to now be voted the European Tour Golfer of the Year for a second time is a fantastic way to bring the curtain down on it,” said Stenson. “To win the Claret Jug, a silver medal at the Olympics, the Race to Dubai and now this means 2016 was a very special year for me, and I am very proud of what I have achieved. “There have been some great golfers who have won this award, and many more who just missed out over the years, so to receive it twice now is a huge honour. The R&A’s bid to maintain The Open as golf’s “most international major championship” has led to two new exemptions for next year’s event at Royal Birkdale. The winner and runner-up in the Kolon Korea Open, which was first played in 1958 and has been won over the years by the likes of leading home players such as KJ Choi, YE Yang and Sangmoon Bae, will secure spots in the 146th Open in Southport. “We are delighted to offer places in The Open for the winner and runner-up of the Kolon Korea Open beginning with next year’s Championship at Royal Birkdale,” said Johnnie Cole-Hamilton, executive director – championships at the R&A. The 2017 Kolon Korea Open will be played from 1-4 June at Woojeong Hills Country Club in the South Chungcheong Province. The tournament is mainly organised by the Korea Golf Association and co-sanctioned with the OneAsia Tour. “The R&A is committed to developing the huge potential of the game in this region and these new exemptions will create more opportunities for professional golfers in this part of the world to qualify for The Open,” added Dominic Wall, the R&A’s Asia Pacific director. Spaniard Angel Gallardo is to take on the new role of European Tour Ambassador from the beginning of next year. The move comes after the charismatic figure announced he was stepping down from his position as Vice Chairman of the European Tour Board of Directors at the end of this year. “It has been a true honour to serve the Board over these many years as I have always held the European Tour very close to my heart,” said Gallardo, a former Italian Open champion who represented Spain four times in the World Cup. Arbroath Artisan amateur Gary Pyott won the final Midland Golfers’ Alliance event of the year, a closely-contested affair at Crail Golfing Society. The five-handicapper carded a one-under 68 over the Balcomie Links to finish a shot ahead of four players - fellow amateurs John Baxter (Lundin) and Fraser Campbell (Monifieth) as well as pros Craig Knowles (Glenrothes) and Paul Jamieson (Dunblane New).